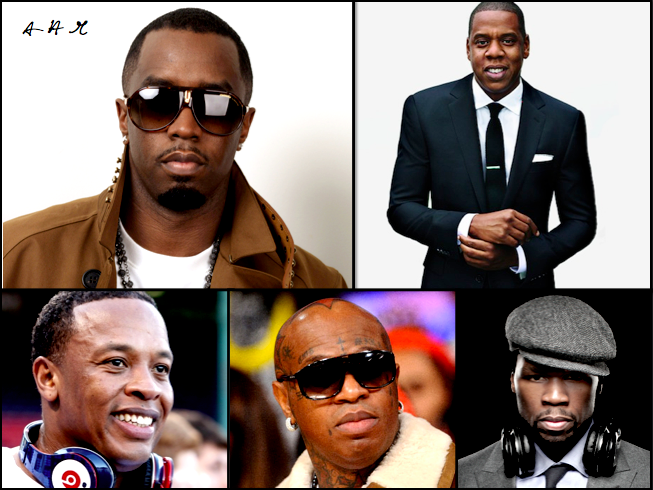 2012’s Wealthiest In Hip-Hop have been named via Forbes Five. The list gets published every Spring ranking the top five moguls in Hip-Hop by net worth. Forbes also has another list “Cash Kings” which ranks on annual earnings. 1. Diddy ($550 million) – As a share in the popular Ciroc vodka, he receives double-digit millions in profit annually. Sean Combs is involved in clothing lines Sean John and Enyce, as well as the marketing firm Blue Flame. Not to mention, his record label Bad Boy Records is approaching it’s 10-year anniversary. To add to the diversity, Diddy has a cable channel in the works called Revolt. 2. Jay-Z ($460 million) – Sean Carter has stakes in the New Jersey Nets, his 40/40 Club chain, an ad firm called Translation, Carol’s Daughter (a cosmetic company) and other business ventures i’m sure. Unlike Diddy, Mr. Carter still holds relevance in the music world. The most recent project Watch The Throne with good friend Kanye West took them on a tour of the world and found it’s name on a platinum plaque. 3. Dr. Dre ($260 million) – The bulk on Andre Young’s wealth comes from headphones. Beats By Dr. Dre, manufactured by Monster have just over 7 months left on the contract. HTC recently bought into the company for $300 million, split a few different directions, it was reported that Dre pocketed $85 million from the deal. With the Beats ruling the headphone market, his stake in the company before the HTC deal was already at $100 million. The Doctor is also the Founder and CEO of Aftermath Entertainment, of the 18 albums released under the label, 14 went Platinum or higher. 4. Birdman ($125 million) – Bryan Williams is the co-owner of Cash Money Records who signed a $30 million deal with Universal for distribution back in 1998. The subsidiary Young Money Records has helped the company strive over the past few years with Lil Wayne, Drake and Nicki Minaj making large splashes all over the industry. Look for Stunna Man to increase his riches this summer as the Universal distribution contract is up and the bidding war will begin. 5. 50 Cent ($110 million) – Curtis Jackson sold his VitaminWater stake back in 2007 for $100 million, which i’m sure is still lingering in his bank account. His ventures range from video-games to clothing to a new line of headphones SMS set to be released this year. Next up, some kind of energy drink called Street King.